Ice fishing may not be for everyone, but there are those who try it out and fall in love right from the start. Now, for those who think that ice fishing is just too much fun and want to continue the experience and expand upon the basic ice fishing gear outlined in my previous article, there are a few more pieces of equipment–tip-ups, a heater, a good shanty, and a sled–that you'll need to solidify the sport's presence in your outdoors experiences. The first item, a tip-up, is the perfect tool for the ice fisherman who wants to bring home a limit of fish to cook. Typically made of wood, or ice-resistant plastic, and rigged with a flag that lifts once a fish is hooked, tip-ups rest over the drilled hole and can be left while you fish nearby. All you have to do when the flag goes up is pull the line, and the fish, from the hole. Fishermen who want to cover a lot of ground and catch a large bounty will drill several holes and equip each with a tip-up to maximize their haul. If you're serious about taking up ice fishing and plan on drilling a lot of holes this winter, it may be time to invest in a gas auger, which will reduce the amount of time spent making holes and allow more time to fish. Strikemaster and Jiffy offer several models, varying in power, that go a long way towards making short time when drilling. Yes, gas augers are more expensive than their manual counterparts, but the ease and swiftness with which they cut through several inches of ice will pay off in dividends, and your arms will appreciate the rest. Shanties and heaters go hand in hand on the ice, and are available in several sizes to suit any need. The optimal shanty will be wind resistant, sturdy, and easy to set up once a good location is found. Companies such as Frabill and Clam make reliable shanties ranging from one-person to even six-person models and companies such as Coleman and Mr. Heater provide customers with convenient and effective heaters that will keep you warm without taking up much room at all. With all this gear, some of it quite cumbersome and uncomfortable to carry, how do you plan on getting it out onto the ice? 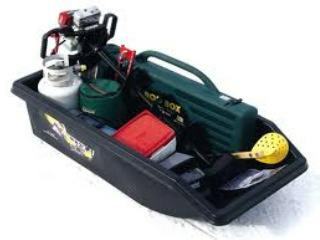 Not to worry, Otter and Team Wild, two established ice fishing outfitters, offer sleds designed to carry any ice tackle you'll need, while easily gliding across the snow when pulled via snowmobile (there are two-hitches available as well) or by hand. Sleds come in a few different sizes to accommodate any combination of gear you'll need for the day; simply pile it all in and drag it behind you. There's a big difference in fishing on a stool every now and then, and relaxing for hours on end in the heated comfort of a shanty. The convenience of such a shelter, as well as the added ease of using a gas auger, tip-ups, and sleds, will pay for itself many times over after several trips out onto the ice. If you find that ice fishing isn't as miserable as you thought it would be and want to get a little more serious, as far as tackle is concerned, the gear I've described here will complete your arsenal. As any angler will attest, cabin fever will make those winter months drag on, but all it takes is some new tackle and an open mind to get out on the water and do what you love this winter. previous articleAlligator Gar: Nuisance or Living Fossil?